Organic Fiber Bar™ Fiber Bars - Voted #1 Nutritional Snack Food Bar! Being voted #1 Nutritional Bar and high fiber snack is a tremendous compliment and just goes to show that high standards, great taste and awesome nutrition truly can go hand-in-hand. Each great-tasting Organic Fiber Bar provides 14 grams of fiber from 3 organic fiber sources, as well as fruit, nuts and other nutritious ingredients. Thousands of you chose Organic Fiber Bar as best nutritional bar and high fiber food, and we thank each and every one of you for your support! Until now, consumers would have to endure the bad taste and texture of drinkable fiber products such as psyllium fiber or consume large amounts of certain foods. 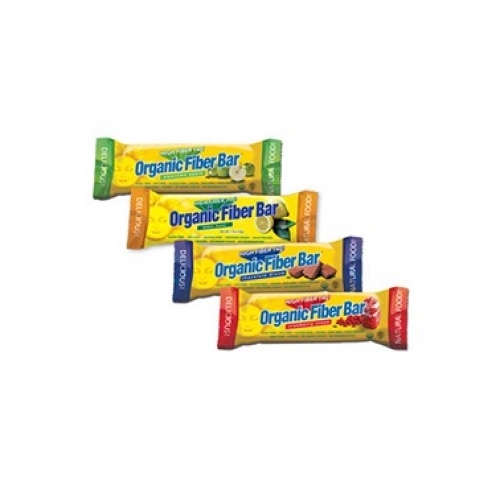 Now with Organic Fiber Bars, consumers have a great-tasting, easier way to get the fiber they need every day. These nutritious bars are affordable and convenient, and make a great breakfast alternative or convenient high fiber snack. Organic Fiber Bars - available in 4 great flavors - Awesome Apple, Chocolate Dream, Cranberry Craze, and Lemon Burst - combine organic fiber, fruit and nuts to provide 14 grams of fiber in each bar, equal to 56% of the RDA.